The annual Martin Luther King Jr. breakfast in Boston highlighted some recent electoral changes and what they suggest about King's vision for society. For instance, freshman Congresswoman Ayanna Pressley thanked Dr. King and his wife Corretta Scott King for their influence on the civil rights movement. 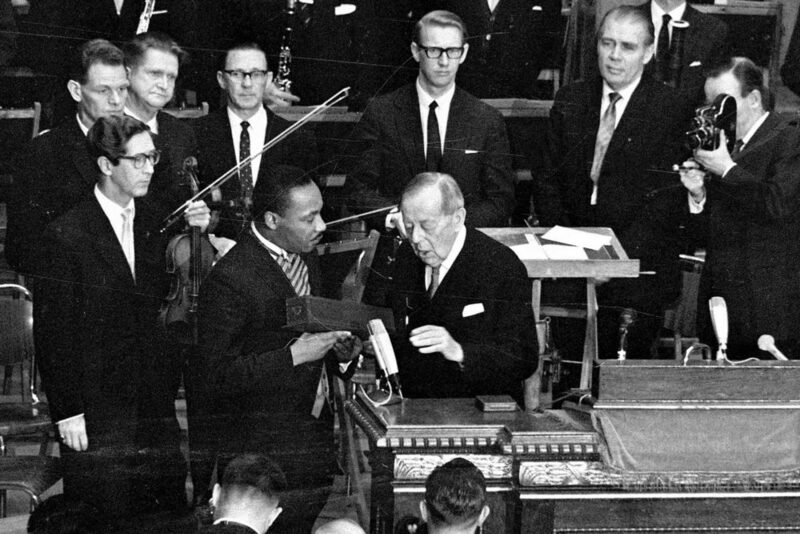 And, while each year we reflect on King's legacy in the U.S., Dr. King also had a substantial international impact. When he was provoking some intense animosity in the U.S., King would be treated like a celebrity overseas. We speak about the inverse relationship between King's global popularity and his perception at home — then and now. Callum Borchers, WBUR Bostonomix reporter. He tweets @callumborchers. Jason Sokol, professor of history at the University of New Hampshire and author of "The Heavens Might Crack: The Death And Legacy of Martin Luther King Jr." He tweets @jasokol. Khalil Muhammad, a professor of History, Race and Public Policy at Harvard Kennedy School. He tweets @khalilgmuhammad. Boston Entrepreneur Proposes Memorial To Martin Luther King, Jr.